Mr. Nicholson concentrates his practice in all areas of personal injury with an emphasis on Medical Malpractice and Complex Litigation. 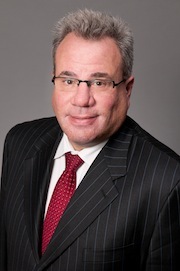 Since joining Goldberg & Goldberg in 2000, Mr. Nicholson has been involved in obtaining verdicts and settlements in excess of $80 million dollars. Mr. Nicholson is an experienced trial attorney, having tried over 30 cases to verdict in his 25 year career. Mr. Nicholson has the benefit of having been on the defense side for the first twelve years as an attorney so he brings a special understanding of the defense perspective to the firm and has a sharp understanding of the law and evidence. Mr. Nicholson also clerked for a Federal Judge directly out of law school. Recently, Mr. Nicholson has developed a niche in prosecuting malpractice cases involving overdoses of radiation during radiation treatment leading to catastrophic injuries and death. He successfully litigated and tried a radiation overdose case obtaining a $16 million dollar verdict and a complex radiation overdose case to settlement of $7.5 million dollars.